Synopsis: Midwestern writer Nick Carraway (Maguire) moves to New York City to try his hand at bond trading. While in New York is befriended by the charismatic and mysterious Jay Gatsby (DiCaprio), who harbors a long-standing love for Nick's beautiful, but married cousin, Daisy (Mulligan). When Gatsby enlists Nick's help in rekindling his relationship with Daisy, it draws the ire of Daisy's husband, Tom Buchanan (Edgerton), who begins to unravel the truth of who Gatsby truly is. Andrew: Hello readers! This past Saturday Sarah and I had the recently rare opportunity to go see a movie in the theatre, considering we weren't on the road somewhere for the first time in four weeks. 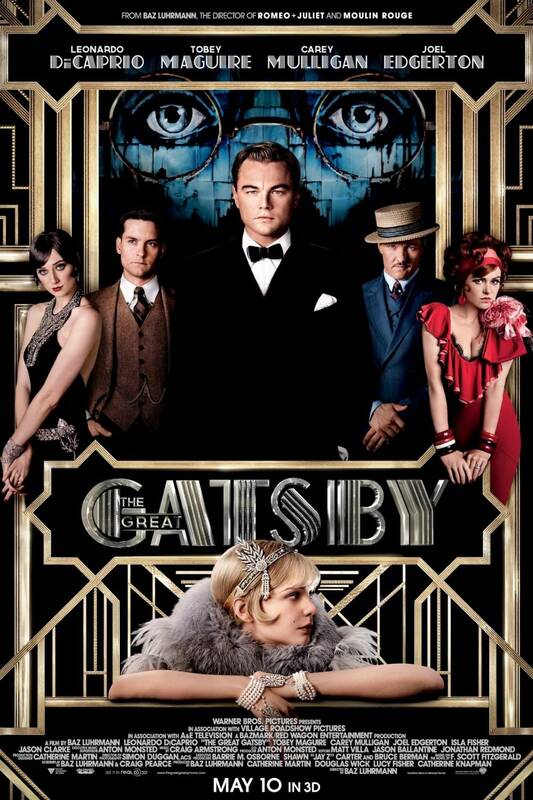 We took that opportunity to see this past weekend's big new release, The Great Gatsby. It's directed by Baz Luhrmann, of Moulin Rouge! 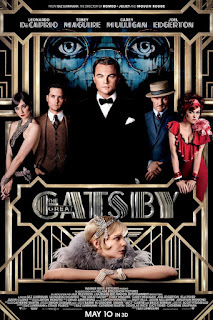 and Romeo + Juliet fame, and stars Leonardo DiCaprio as the rich and mysterious Jay Gatsby, Tobey Maguire as his neighbor/writer/bond salesman Nick Carraway, Carey Mulligan as Daisy Buchanan (the object of Gatsby's desire), and Joel Edgerton as Daisy's husband, Tom Buchanan. S: The trailers for it have been absolutely AMAZING. They made it look like it was going to be another Luhrmann spectacle. A: To be quite honest, I never read "The Great Gatsby" - I wasn't made to read it in high school, I wasn't made to read it in college, and I've never read it just because. So this was my experience with any version of this tale. S: So I'm familiar with it. But it's an incredibly difficult book to read, and the original film adaptation starring Robert Redford and Mia Farrow is extremely dull. Watching it is like pushing rope. It's a little rough. But since I knew the story - or loosely knew, it's been a while and this was kind of a refresher - I'm curious as to what you though of The Great Gatsby. And let's preface this: we're a little tough on Luhrmann because we hold all his other movies in relation to Moulin Rouge! whether that's fair or not. A: Yup, Moulin Rouge! is definitely one of our favorite movies, and I like Romeo + Juliet. I like it more know than I did when I first saw it, but that's because I didn't quite get Luhrmann's style when I was younger. I saw Strictly Ballroom many moons ago, as well, and enjoyed that one. But I've never seen Australia, and from what I've been told that's not a bad thing. A: Anyways, I'm a little torn on The Great Gatsby because I actually thoroughly enjoyed the first 30 or 40 minutes of it, which is leading up to actually meeting Jay Gatsby. We're introduced to Nick Carraway in a mental institution, which from what I've read on the internet lately, is not in the book. So that's clearly a story-telling device that Luhrmann also used in Moulin Rouge! So the film cuts between Carraway talking to his psychiatrist, telling him the story and about how he moved into a house across the bay from his cousin Daisy and her husband, and we're introduced to those characters and see how Tom has a mistress, just all this introductory stuff getting to know these characters. But it's the spectacle of it all...Tom Buchanan's mansion, the drunken get-together Tom and Nick have at Tom's little getaway in the city with his mistress, the first party we see at Gatsby's house...all of that, to me, looked amazing. I loved the anachronistic music and I thought how we saw glimpses of Gatsby but they kept him a mystery for a while. And then even his introduction was great, it was very James Bond-esque. A: From that point on? It was incredibly boring, and while everything looked great and there were some good performances, I kept thinking to myself, "They are so dreadfully DROLL. I'm SO glad I didn't have to read this book in school." S: So here's the thing: this is considered a "Great American Novel" and it sort of is. It's a story of hope and living the American Dream, and that's all great - but there is not ONE likeable person in the entire story except for maybe Gatsby. All of the other characters are vapid and egotistical and spoiled rotten. A: Even Gatsby is vapid! S: True, he's vapid, but all he wants is Daisy! She's his long lost love, and everything he's done in his life is for her. And she just turns him down flat! A: Well he went about it the entirely wrong way. S: It's just a terrible story! S: It's a terrible story. A: It reminded me a lot of Twilight, in that the relationship between Gatsby and Daisy is not one to be looked at and admired by younger girls. S: He's so much better than Robert Redford was. Something Leo can do that Redford can't do is that Leo can always look mysterious. He can get this dark look about him, this dark side, and Redford couldn't really do that. So Leo fit the role better in my opinion. A: Leo was also funny in the role. The scene where Jay and Daisy reconnect for the first time in years? Leo is appropriately funny and awkward...that scene was great and he was great in it. But with the exception of Joel Edgerton and maybe Isla Fisher as Myrtle, Tom's mistress...with the exception of them, everyone else in the movie was miscast, I felt. Tobey Maguire as Nick and Carey Mulligan as Daisy? S: Here's my thing with Tobey Maguire: he probably shouldn't work in Hollywood again. He's horrible. A: That's harsh! (laughs) He can be a good actor! S: When??? When has he ever been good? He is as dry as 12-month old corn flakes. S: Ugh, but he's so dry and so boring. He can't do an accent or infliction well. The man can't act. I'm sorry but his delivery of lines felt so scripted it's not even funny. The man should never work in film again. A: How about that scene where he yells at a bunch of reporters? S: Oh my God, it was so bad. It was laughable. A: I will say this in defense of your stance on Tobey Maguire - the character of Nick Carraway is supposed to be disgusted with everyone except Gatsby, and at no point in the film did I ever get that feeling from Maguire. I just didn't. A: But her voice and the way that she acted the role just didn't connect with. I didn't buy her relationship with Leo's Gatsby. S: No, no...it didn't feel like she was giving it 110 percent like he was. A: I feel like the relationship between Gatsby and Daisy was the key to the whole movie, and I just didn't buy it. S: Her chemistry with Leonardo DiCaprio just wasn't there. I thought DiCaprio gave it his all in this movie, and he must have made a deal with the Devil because he still looks like he's 25! Anyways, it sounds like you didn't like this movie! A: I'm torn! I really am. I really liked the first 40 minutes! I really liked it right up through when Gatsby and Daisy met again. As soon as they're together again and he starts showing off his house? He's basically like James Franco in Springs Breakers going, "Look at my sh*t!" S: Yes! (laughs) Look at what I have! But, he does it because he did everything for her. He really kind of thinks she's vain and materialistic, and it turns out that he's the one who is. A: Absolutely. So up until that point, I think right when stuff gets to get serious and the weather turns during that scene, from that point on I did not like the movie. And I really just kind of was waiting for it to end then. S: Spoiler alert!? If you don't know the story or haven't read the book, like my husband here, you know he dies. A: Fair. (laughs) But so he dies, and then the movie keeps going! It dragged on with Nick giving more exposition and I just couldn't handle it then. S: It was so bad. A: It's like, "Dude, we get it." It reminded me of Spring Breakers, they overdid it on repeating the visual themes. But I guess overall I liked it. I thought the movie in its entirety was fine. S: It certainly looked good. It looked fantastic. I loved the music and the set design was fantastic. The 3D actually looked beautiful and added something to the movie. It's just a sad story. That's something that you have to remember, it's a very sad story. And...I don't know...it just hits me in a certain way. A: I got the themes of hope, the American Dream, excess, idealism, all of that, but when all was said and done, this movie was just pretty to look at. S: It was, and that's really what it comes down to. It's been given the Baz Luhrmann treatment, and I guess if even he can't make it interesting to watch, no one can. FINAL VERDICT: Worth seeing in the theatre for the 3D alone, but if you don't care about things like that, how it looks, 3D...then just skip it entirely. Don't feel so bad Andrew about not reading Gatsby. Not because you shouldn't read it, but because in so many reviews I have read, the authors had not read any of Fitzgerald's work. I enjoyed some of the performances and the costume design but that was about it. I found the camera work, directorial flourishes and modern soundtrack completely distracting.